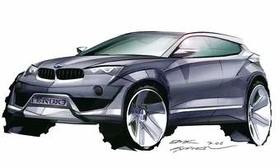 Sketches of a future X3 hint at the styling direction BMW plan for the X4. BMW appears set to add an X4 as part of plans to expand its crossover lineup in 2014. Conceived along the lines of the highly successful X6, the X4 is a smaller and more agile four-seat model. Although it shares the same floorpan, drivelines, chassis and engineering hard points as the X3, the X4 is set to receive individual styling in a move to give it a more sporting image and enable BMW to position it higher than the crossover upon which it is based. “The design is not finalized, but we know the direction and it will likely surprise,” a source told AutoWeek, which is a sister publication to Automotive News Europe. The X4's exterior design changes would make it less practical than the more upright X3, leading to reductions in headroom and luggage capacity. But strong sales of the X6--it has easily beat targets announced at launch in 2008--have convinced BMW bosses that customers are prepared to forego everyday usability in the name of style. BMW's rival to the upcoming small Porsche, expected to be called the Cajun, was first proposed by in-house designers in 2006. However, capacity concerns at Magna's factory in Graz, Austria, where the first-generation X3 was assembled, ultimately led BMW to postpone a decision on the X4's future. Things changed when second-generation X3 production switched to Spartanburg, South Carolina. “With the move into North America we're able to take advantage of greater production flexibility,” a high-ranking BMW insider told AutoWeek at the recent Paris auto show. While stopping short of confirming a definitive production approval for the new SUV, AutoWeek's source suggested it had the backing of CEO Norbert Reithofer, who is expected to announce its addition to the lineup as part of BMW's plans to sell 2 million cars annually by 2020. The X4 is expected to come with a choice of four- and six-cylinder gasoline and diesel engines mated to a six-speed manual, a seven-speed dual-clutch or an eight-speed automatic transmission. Like the X3, BMW does not plan a two-wheel-drive option. Sitting at the top of the lineup will be a performance-orientated X4M model boasting styling upgrades, a future twin-turbocharged inline six-cylinder and a seven-speed dual-clutch transmission from the BMW M division.